Topps announces that it has produced collectible "Chips" of the four baseball teams competing in the 2004 League Championship Series. 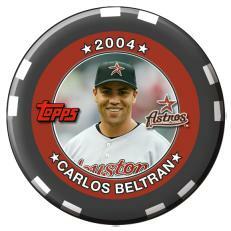 Exclusively through www.topps.com, collectors have the opportunity to purchase 25-player/manager Chip sets of their favorite World Series hopeful - New York Yankees, Boston Red Sox, Houston Astros and St. Louis Cardinals. Each unique set can be purchased for just $39.99 and will only be available only through the 2004 World Series.